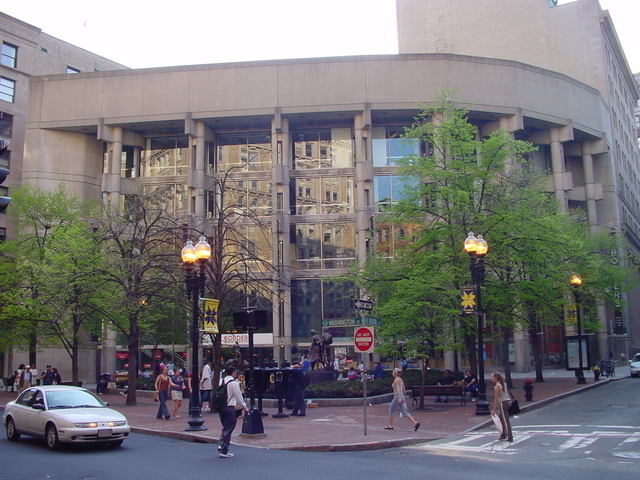 Across School Street from the Old Corner Bookstore is this structure, built in 1973 by the Boston Five Cents Savings Bank as an extension of its headquarters building (at right). The building was designed by Kallman, McKinnell & Wood. The Boston Five would later be purchased by Royal Bank of Scotland's Citizens Financial Group in the mid-1990s. Copyright 2004, Garrett Wollman. All rights reserved. Photograph taken 2004-05-01.